Another Lo with the Crate Paper On Trend Collection Pack – the papers in this pack are just fantastic. It was Felicity’s 5th birthday party and one of her presents was a Make Up Kit – what fun she had putting it all on. We love the Couture Creation Chandelier die it is a great addition to a LO. Also the Quintessential Quote Stamps by Dyan Reaveley Dylusions is a super stamp set to use on LOs and Cards – we have these stamp set in store @ Craft Haven, and the Chandelier die too. I am pretty sure that with sparkly shoes and a new tiara she could conquer the world. 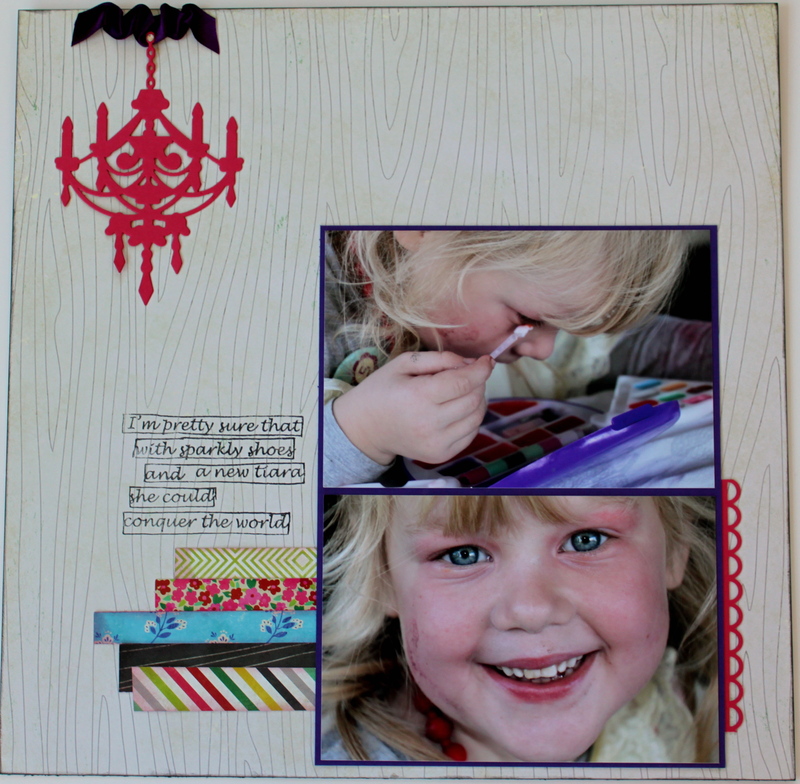 I adore the Crate Paper – On Trend Collection Kit – we have used it for a whole bunch of layouts recently. 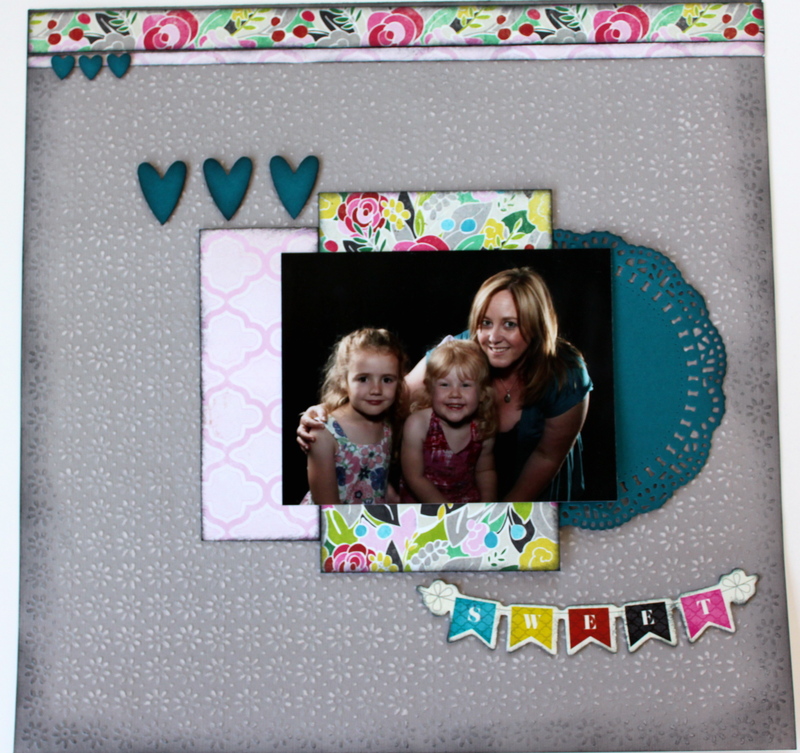 Combined with another favourite – Two Scoops Cardstock and I am loving this LO. There is nothing like a little sanding and inking to add great dimensions and layers to your page. This LO is very fussy when looked at besides some of the more simplistic ones we often post – but the Crate Paper, On Trend Collection kit is so full of beautiful papers it is a shame not to spend a little longer on a LO. There are lots of layers made with two scoops background sanded to distress, some LYB doilies, Tim Holtz Stamps, Inking, Rosette, paper rosebuds, embellishments from the kit and more – wow how cool is that. We just love these cute photos and how the page comes together to showcase these two special girls – G & F (Gwyneth & Felicity).